I have always been a bit of a Monet fan. I love the colours, I love the texture and I love the subject matter. I also love the way you can look at one of his paintings from a distance and it looks perfect and yet up close it is a mess of beautiful colours. 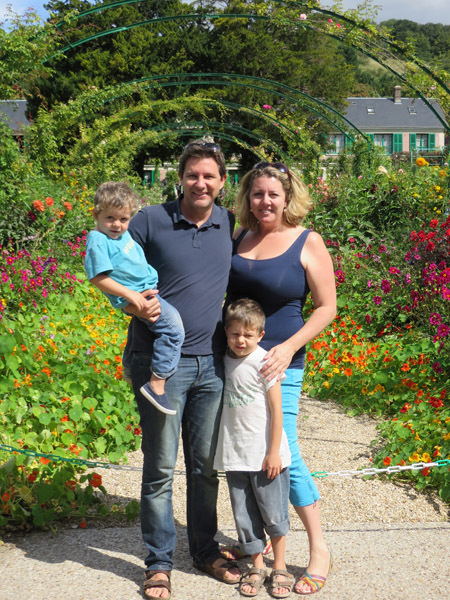 As we had a bit of time in Vernon we waited until a day where the weather was perfect before we headed out to Monet’s Gardens in Giverny. We had driven out twice before but the queues were quite long and rain looked possible so we decided to wait until we could go early on a clear day. I am so glad we did as we arrived before the major tour buses got in and had an hour or so in the garden before too many people arrived. To put it in words ….. It was glorious! They really have done a wonderful job. I love gardens on a good day, this was a particularly good day. We were able to wander through his gorgeous home and some of the rooms were set up exactly as they had been when he lived there. Everywhere you turned there was a beautiful painting right in front of you. The flowers would sway in the breeze and there were birds, butterflies, insects and bees all having a field day in and amongst the flowers. We got to go out to his little lake and take photos of one of the scenes he is most famous for; The Water Lillies. It was all just so pretty. I kind of felt like I was in that scene in Mary Poppins where they all jump into the chalk drawings on the side walk! We took so many amazing photos and even managed to get a nice family shot right in the middle of a lovely flowering area. For those of you who have young kids, you will appreciate any photo where your kids are not only looking (sort of) at the Camera but also (sort of) smiling. It is a semi-miraculous feat and a real bonus that the background was so pretty. The kids had a great time wandering around. Tom really enjoys being outside and learning about nature. Milo happily played amongst the flowers and then naturally found some chooks. Scott and I just enjoyed sitting on a park bench for a bit soaking it all in. Sorry if this all sounds a bit soppy but it really was a magical place to visit. I loved every minute we were there. Even the kids didn’t whinge about wanting to leave! Claude Monet noticed the village of Giverny while looking out of a train window. He made up his mind to move there and rented a house and the area surrounding it. In 1890 he had enough money to buy the house and land outright and set out to create the magnificent gardens he wanted to paint. 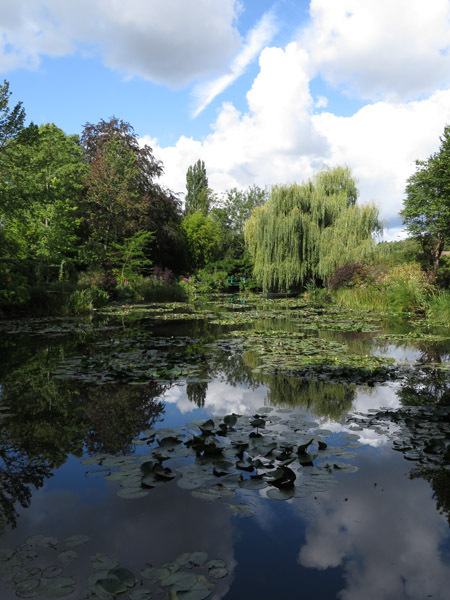 Some of his most famous paintings were of his garden in Giverny, famous for its rectangular Clos normand, with archways of climbing plants entwined around colored shrubs, and the water garden, formed by a tributary to the Epte, with the Japanese bridge, the pond with the water lily, the wisterias and the azaleas. More photos from the Lilly pond where the kids discovered that if you drop a leaf on one side of a bridge, 10 seconds later it comes out the other. This might have gone on for about half an hour! Milo learnt how to smell flowers. 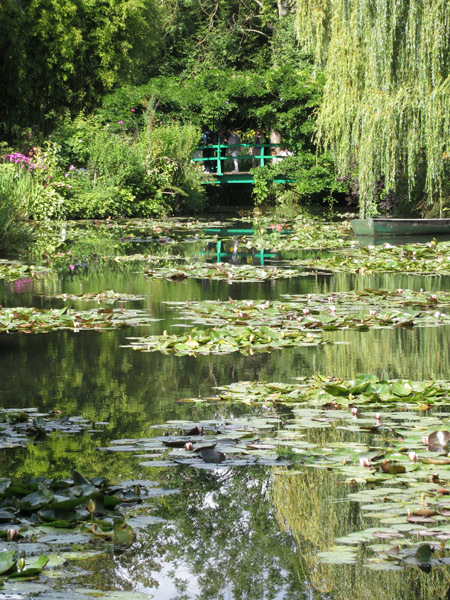 You can have a look at some of Monet’s Paintings here. After we had finished we went to the gift shop and bought a few little things. I am not one to carry a lot when we travel and if I buy anything I buy art or things for our house (rugs, textiles or fabrics). However my latest thing is Magnets, they are small and don’t weigh a lot, plus you can get some really cool designs, they make great mementos, plus …. you always need a magnet on your fridge. A perfect day wouldn’t have been complete with out an ice-cream at the end or bubbles. As we walked back to the car a little fairy shop blew out 1000’s of bubbles. The boys squealed with delight as they chased them down the street. We went home, had a beautiful bottle of wine in the backyard in the sunshine. Wouldn’t mind doing this one all over again!!! So pretty! I want to go. You would love it. Let me know if you need any help with your itinerary around Paris in April.